**From $20,395 installed. This unit must be installed by Pacific Coast Avionics. The Aspen Evolution Flight Display System brings technology and capability – formerly available only in the latest aircraft or at enormous expense – to your aircraft , with little more down-time and cost than overhauling your antiquated mechanical gyros. The EFD1000 PRO PFD and EFD1000 MFD are based on the latest digital electronics and LCD technologies, and they allow you to quickly and easily upgrade the vertical pairs of instruments in your six-pack; from one to three pairs, all at once or one at a time, as your needs and budget require. Not only is the system designed to work with the avionics currently in your panel - extending the life of your existing avionics, the Evolution system evolves with you via future software upgrades, maximizing your investment. The EFD1000 PRO PFD gives you all the major tools that help professional pilots fly safely and easily in instrument conditions, at a fraction of the price. The Pro features integral ADAHRS, HSI, backup battery, emergency GPS, altitude alerter, GPS roll steering-plus a whole lot more. The built-in air data computer shows you wind speed and direction at all times, with an arrow to help you visualize the winds aloft. 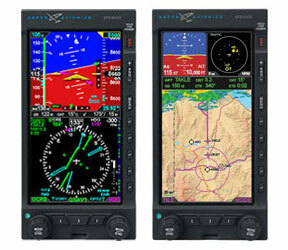 And knowing your indicated airspeed, altitude and outside air temperature, the air data computer (ADC) constantly displays your true airspeed. Optional weather and traffic interface is also available. 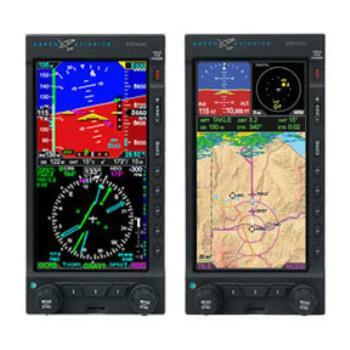 The EFD/5001000 MFD is designed to enhance your choice of Evolution primary flight display, adding moving maps, datalink weather and traffic interfaces, a built-in terrain awareness database, flight information pages and more. Built using the same hardware as your PFD, this EFD1000 MFD gives you a full duplicate set of ADAHRS sensors, works with your PFD to continually monitor its health, and can automatically become a backup PFD if your primary should deteriorate or fail.